Does your 7 year old dream of being a superhero one day? 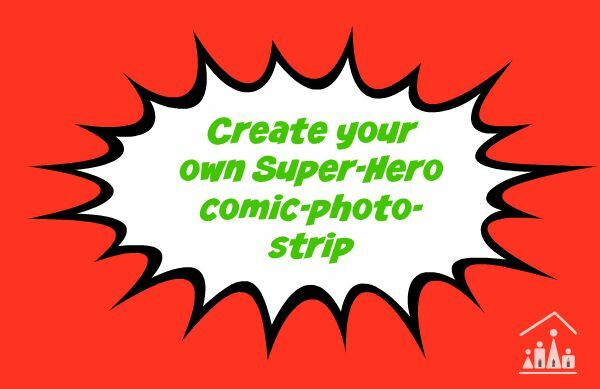 Set their imaginations free and make their dreams come true when they create their very own Superhero Comic Strip using basic tools. I decided to channel my son’s love of technology into an activity that he struggles with, for this week’s Super-hero themed post for the 2nd Grade Blogging team. Liam has really been enjoying the time we have been spending on these activities just for him. He is looking forward to doing his homework now at his new Homework Station . Plus he has a good grasp of basic fractions now after last week’s Apple activity. As a child I loved making up and writing stories. And whilst my two younger children seem to have inherited this love. My eldest son freezes up if he is presented with a blank piece of paper, that he has to write his own words onto. He would much rather be playing maths puzzles on his tablet or kicking a ball around outside. This is perfectly fine, as we all excel and like different things. But I do feel that it is important to work on his confidence in this area now. He will be doing a lot more of it in 2nd Class and beyond and I don’t want him to dread doing it forever. I came up with the following activity to help him over come his fear of writing stories. To help build his confidence in coming up with words for his own stories, I set him the challenge of designing his own Super-hero story. To encourage him I asked him to use his Lego pieces and mini figures to act it out. Whilst his hands were busy, we chatted away about what was happening in his story. Then instead of writing it down onto paper, he used his tablet to take photographs of each scene in his story. I helped him transfer his photographs onto my laptop. 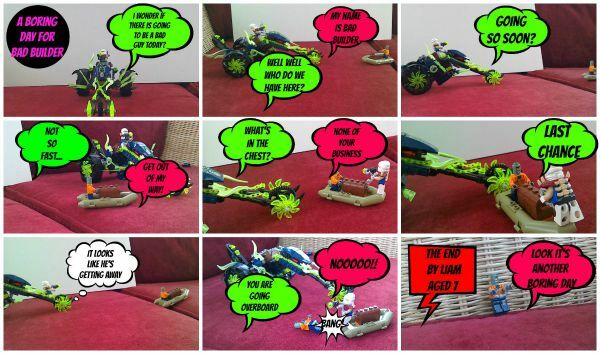 We then worked together, using the free photograph editing tools in Picmonkey, to turn his story into his very own comic strip. 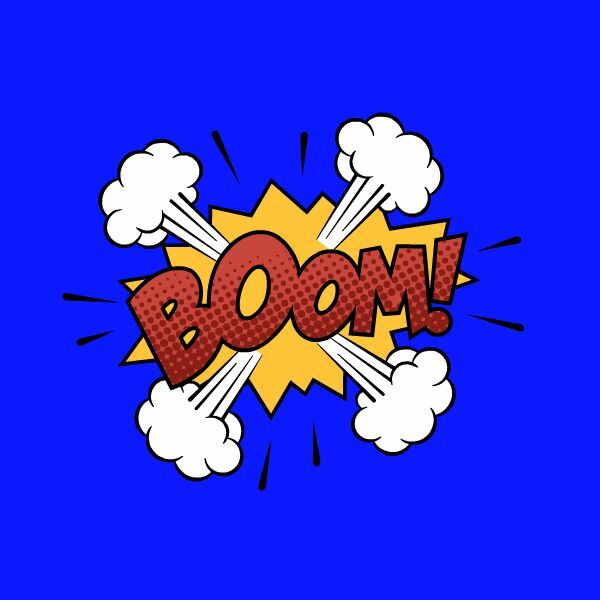 You can find speech bubbles, sound effects, narration boxes, hero shields, hero masks and fonts to accompany your comic photos in Picmonkey by going to Edit – Themes – Comic Heroes! He had taken 9 photographs to tell his story. We uploaded them into the Collage section on Picmonkey. I helped him to put these into the correct order for his story. We then added speech bubbles into each window of the collage and he typed in the words of his story. We kept it quite basic, as this was his first time using Picmonkey and I didn’t want to over-power him. But I’m sure next time he will be insisting on a few more special effects! By using his love of technology and Lego, I was able to show him that he is very capable of writing his own stories. This was a huge confidence boost for him. Now I don’t think we will be able to do this for his homework every week. But hopefully doing this activity will make his next free writing exercise go a little more smoothly. Super Hero States of Matter from Look! We’re Learning! I love how you combined using technology and writing skills! This is exactly the sort of activity my daughter would *love*!! Thanks for sharing!! Neat! My daughter has been into drawing comic strips, but I never thought of having her use PicMonkey!